The thesis considers the problem of grasping for autonomous robots, with a focus on the design and construction of robotic hands and grippers. The approach we take is to fundamentally reconsider the basic motivation and goals for grasping that steer hand design. We consider grasping as the result of reliable and robust patterns of interaction between hand, object and environment which are mechanically opaque to the robot. 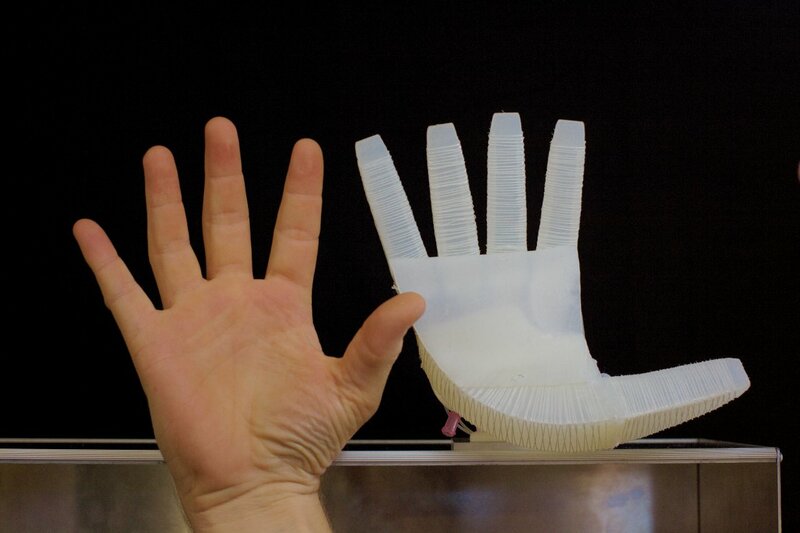 This motivates the investigation of a new type of robotic hands, pneumatic soft hands. These hands enable the robot to collide with objects safely, maintain contact under disturbance, and provide many places of contact for a robust grasp. At the same time they intend to lower requirements on control and perception compared to fully actuated hands. Due to the fundamental change in perspective compared to the classical, mechanics-centric view in grasping, I believe we will ultimately have to reconsider all aspects of a robot system to use soft hands effectively. We call this alternative view the Soft Manipulation paradigm. In this thesis we propose a list of defining principles for Soft Manipulation and focus on the ramifications for hand hardware, but we also consider the adjacent domains of hand control and grasping strategies. Research on soft hands is complicated by the fact that the technology and body of knowledge for building soft hands only is emerging right now. 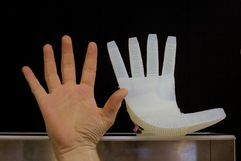 The thesis contributes the groundwork for soft hand research by developing a coherent and comprehensive set of tools to rapidly prototype pneumatic soft hands. This toolkit is built around a versatile and easy to prototype actuator design named PneuFlex. The thesis will cover all aspects of prototyping such as designing mechanical properties, manufacturing actuators, assembling them into hands, and controlling them without interfering in their compliance. We also propose and validate a fast and stable dynamic simulation model for the simulation of pneumatic soft hands which for the first time makes interactive and automated design of soft hands feasible. The thesis also explores the properties and capabilities of pneumatic soft hands in a series of grasping experiments with the help of two artifacts, the RBO Hand 1 and RBO Hand 2. We investigate their shape adaptability, their grasp dexterity, and their suitability for implementing grasping strategies that exploit environment constraints to motion for robust execution. We will see that soft hands built with technology developed in the first part of the thesis provide a solid foundation for further research on Soft Manipulation.